Emotions run high in multi-award winning Casablanca, with the international political tensions of WW2 providing a backdrop for the heartbreaking love-triangle of three remarkable characters, each of great virtue. 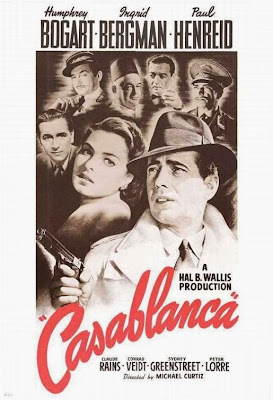 Rick Blaine (played by Humphery Bogart in his first romantic leading role) runs the coolest bar and casino in Casablanca in Vichy-controlled Morocco, a city where multitudes of refugees are left stranded, seeking passage to Lisbon and then on to the New World. Business is booming, when, ‘of all the gin joints, in all the towns, in all the world,’ Ilsa Lund (Ingrid Bergman) walks into Rick’s. Suddenly, their painful past together in Paris is stirred up again, amidst the already politically tumultuous life of Casablanca. Ilsa is travelling with the internationally renowned Victor Laszlo (Paul Henreid), a Czech Resistance leader who has escaped from a Nazi concentration camp. They must flee to the States, but every political power in Casablanca seems to be against them. Can they enlist the help they so desperately need? I found myself close to tears too many times to count while watching this Hollywood classic. Max Steiner’s score, all based around Herman Hupfeld’s “As Time Goes By”, really grabs you, the theme playing out in various permutations, reminding us constantly of the central tragedy gripping these characters. But, of course, the great tragedy of Casablanca is the war itself. The life of every character we meet has been torn apart in some way by the aggressive, totalitarian pride of the Nazis and their war on Europe. Many of the cast themselves were refugees (this movie being filmed in 1942, after all), and critics comment often on the palpable emotion these actors bring to even the most minor of roles. For me, the most moving scene is in Rick’s, where German officers sing in competition with a spontaneous and rousing mass refugee chorus or the French national anthem - apparently many of the cast broke down altogether in the filming of this scene. What truly gives Casablanca its lasting effect and significance, then, is the way that hands-on producer Hal Wallis and director Michael Curtiz capture the desperation of life during the war. I was reminded suddenly while watching this film, just how close the Nazis got to taking over Europe. We really take it for granted that the bravery and resilience of characters like Laszlo prevented that terrible potential future. So, while the love story is heart-breaking in itself, I don’t think this film would have so nearly a potent effect on the viewer without its powerful and moving insight into the struggle for a free world. It was so nearly overthrown.